EGC's F-Series chambers offer great flexibility. Fully adjustable cantilever shelving easily adjusts in 3" increments with no tools required. The shelving can be removed completely to achieve a variety of growth heights. Chamber airflow can be directed upward from a slotted chamber floor for full height experiments or through the perforated rear wall plenum for multi-shelf use. Two independent, counter-balanced, top level light canopies easily adjust vertically across the complete growth height range. Middle and lower tier adjustable shelves with integrated lighting can be configured to obtain a range of growth area footprints. F-Series chambers are fully customizable. EGC can help to design a chamber to meet your needs. 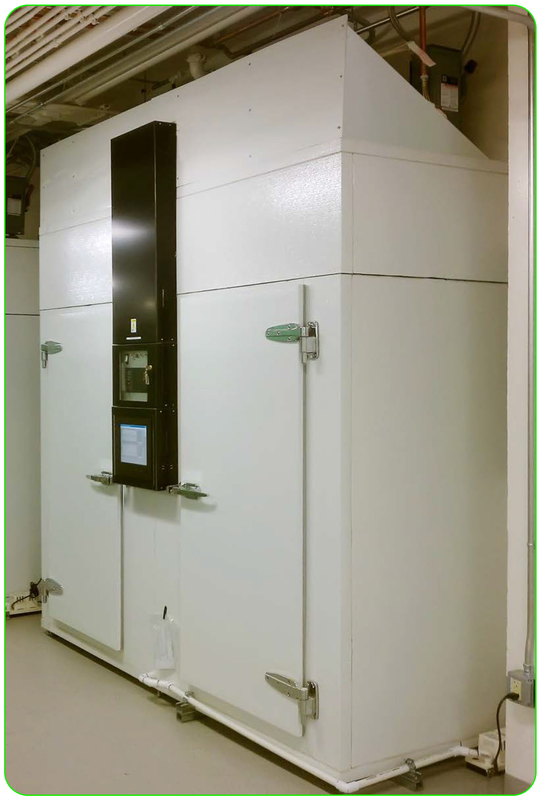 EGC's Two Phase Direct Expansion (2∅dx) refrigeration and custom designed controls are tailored to each application in order to provide the superior control and uniformity your research demands.